adidas Football has today revealed the Manchester United third kit for the 2018/19 season. Celebrating the club’s fourth year with adidas, this shirt is inspired by the 50th anniversary of United’s first European Cup win. Enjoy! After a - from Manchester United standards - disappointing season, the Red Devils managed to secure Champions League football for the 2018/19 season. Today, adidas has launched the Manchester United Third Shirt 2018/19, which the club is gonna wear on the European away trips and a lot of other games next season. 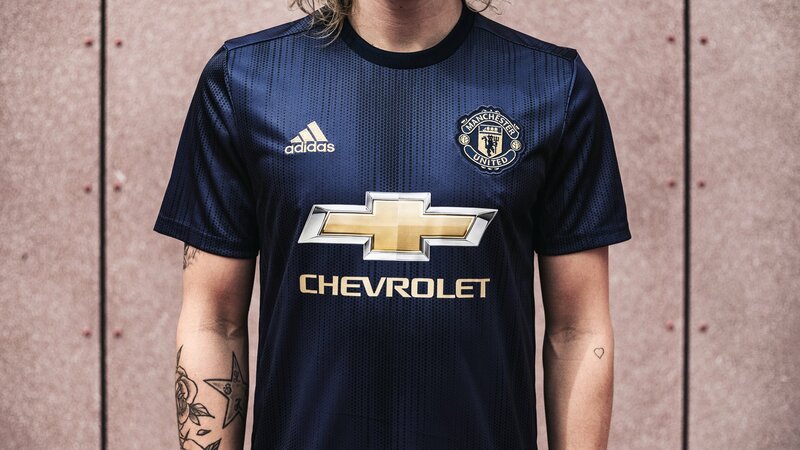 The shirt is gonna have its debut on the Manchester United pre season tour. Made from a 100% recycled polyester interlock material that incorporates Parley Ocean Plastic, the new Manchester United third kit fuses performance technology with sustainable design. It features an all-over-printed adidas football graphic and bold navy blue colouring, inspired by the royal blue kit worn by the United team in the 1968 European Cup Final victory. Gold detailing on the adidas logo and club crest pays homage to the cup final success, making the shirt a must have for the big Man Utd fan. Pre-order your Manchester United Third Shirt 2018/19 right here, right now.